After spending as much on paper, ink, and parts as I did purchasing the printer, I decided to put another ($400) drop in the bucket to pick up a X-rite (formerly GregtagMacbeth) i1 Basic Pro spectrophotometer (a.k.a Eye-One Pro, EFI ES-1000) on Ebay. This tool handles profiling both my display and my printer. Display profiling confirms that the colors on the screen are actually what’s in the image file. Printer profiling confirms that the ink hitting the paper matches what the computer thinks it’s sending. Having both sides of the equation in place means what you see on the screen should match what you see on the page. Calibrating my printer and looking good doing it. In my last few projects, I’ve been dealing with lack of supported software for older hardware. This effort is no exception. The i1 Basic Pro (Is that an oxymoron or what?) originally came with i1Match, ProfileMaker and MonacoPROFILER all of which won’t run on my Intel-based Macbook running OSX 10.8. X-Rite recommends upgrading to i1Profiler. You can download it from their site easily enough, but unless your device has a license key for it, it will run in evaluation only mode. There is an upgrade path you can buy, but that will run you $699. For that I could have bought a brand new i1 Basic Pro 2 at $1200. Though, more likely, I would have gotten the popular and less-expensive prosumer version, the ColorMunki Photo. From previous experience, I was aware that the open-source software, ArgyllCMS, supported the i1 without purchasing the upgrade. It’s worth noting that with X-Rite and Spyder a lot of their offerings have the same device and it’s only the software included that limits or enables the device’s capabilities. So, using ArgyllCMS can allow you to get more for less (i.e. free). Installing Argyll is very straightforward. The website has some instructions for Mac installation which I needed to modify for my newer OS. Here is a revised version that should work on 10.8.5 and later. Download the latest version and unzip it. I put the resulting folder in my Application directory. I also recommend removing the version number from the folder name so that when you upgrade, you can just drop the updated files in this directory without having to redo the next step. On the Mac, you will need to add the ArgyllCMS to the path. So, once you’re done, you just need to open Terminal, navigate to the ArgyllCMS directory and run the commands that follow. I keep the commands saved in a text document so it’s a cut n’ paste operation. Easy peasy! See my earlier post for a handy utility that opens terminal directly from a Finder window. Hmm. Yup. Yup. Yeah. I recognize some of these words. Yup, definitely words. Even if you know what Color Management is, the documentation can be a bit dense; detailed to the point of obscurity, some might say. If you don’t know what Color Management is, then you may want to start backing away very slowly. 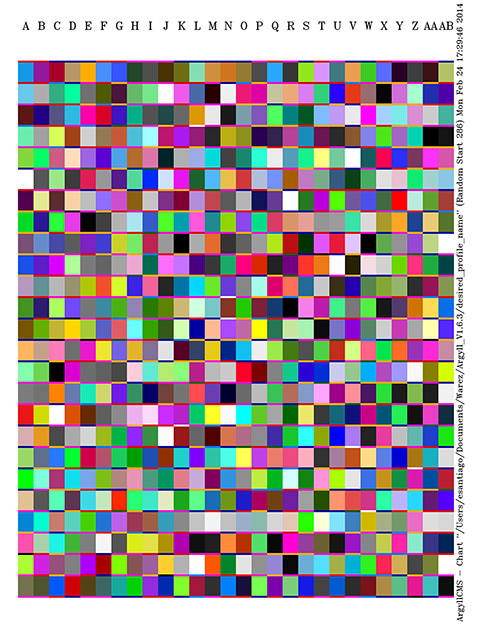 While I lack an advanced degree in color theory, I do have quite a bit experience with command-line programs. So, after a few days of trial, error, and Google, I have developed a simple workflow that should help other newbies get started. If you just want the ArgyllCMS commands I used without the details and colored commentary (pun intended), jump to the Summary at the end. 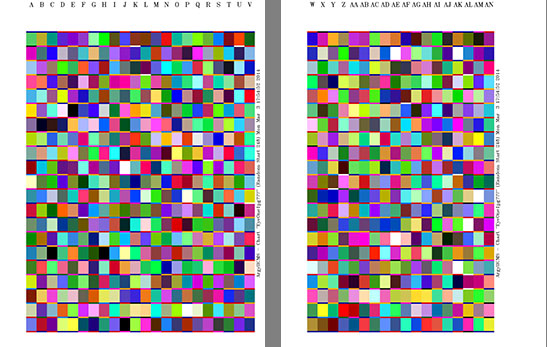 By default, targen with the minimum options for an RGB printer [-d2] will generate 836 patches, which when printed on US Letter, will span a little under 2 pages. Name an aquatic animal that can see more than RGB? How the heck does the K in CMYK mean black? Is RIP something that only pertains to funerals? Did you buy your fine art printer at Costco? Answers: 1) The Mantis Shrimp, 2) The K in CMYK stands for “Key Plate”. In CMYK, this is usually done with black ink. Plus, B already meant Blue. 3) No. See Raster Image Processor. 4) Seriously? If you answered “What the what?” to most or all of these questions, you probably have a printer that uses an RGB driver regardless of how many ink colors are physically put into it. If you have a driver or RIP that is printing directly to CMYK, than you should probably be writing this article. I humbly await your comments. But, I digress… Good paper’s not cheap. So, I wanted to maximize the patches per square inch. If you look at the chart at the bottom of the targen documentation, it lists the ideal patches/page for your device. For the Eye-One Pro, it’s 462 for 1 page, 924 for 2 pages, and in multiples of that so forth. With some fiddling, I got 700 patches on a single letter sized sheet. Let’s break down how. [-G] – “Generate good optimized points rather than Fast” because good is better than fast. That’s what she said. [-e8] – White color test patches. Default is 4. [-g128] – Prints 128 greyscale patches so you can do accurate B&W prints later. Probably want to multiply this if you do multiple pages. [-f700] – Overall patch count. Some threads I read suggested patch counts of 2000-3000 for accurate profiles on large format printers. That seems excessive to me. The profiles I produced with a single sheet looked great. Though if you wanted to, just scale the [-f] number accordingly; 1400 for 2 pages, 2100 for 3 pages, etc. This is the part that I spent the most time tweaking. Setting the number of patches is easy. Getting it to fit properly on the page will kill a few trees. Here’s how I got the one pager above. [-v] – Because watching the text output makes me feel like Neo. [-L] – Gets rid of the extra whitespace created for the clip on the scanning board. You don’t need it. It’s a over-engineered gimmick. [-a0.87] – Scales down the patches. The i1 can read patches a minimum of 7mm2. Default is 10mm2. [-m8 -M8] – Sets the top/bottom and left/right margins to 8mm. [-P] – Doesn’t limit the strip length. If you want to print multiple pages and modified the patch count accordingly inTargen, you don’t need to change anything here. 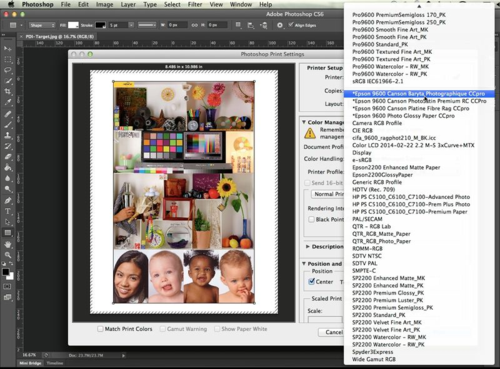 Use the Adobe Color Printer Utility application to print your targets without color management applied. 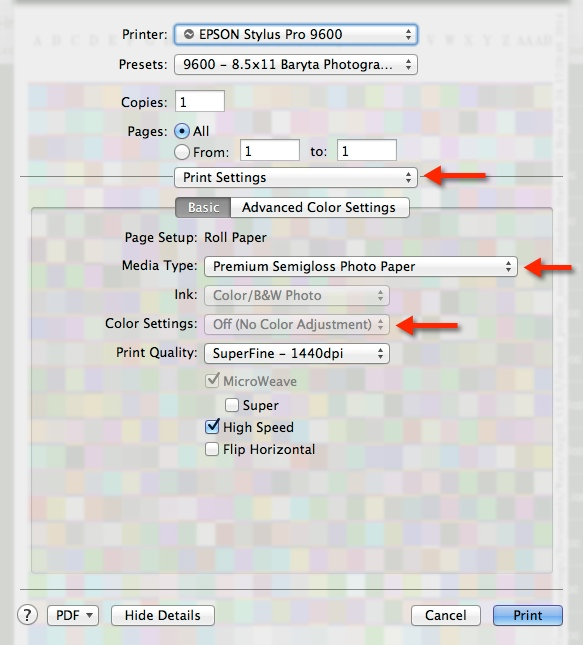 Don’t use Photoshop, since newer versions don’t let you print without color management. With Epson printers, you also want to be sure you’re not using the color controls built into the printer. I’ve also heard you can also use Mac’s native ColorSync (Applications > Utilities), if you select “Print as Color Target” under ColorSync Utility on the print options. While I couldn’t see any difference between the outputs of the two methods, I went with the Abobe utility as it was recommended by more users. In the Adobe Color Printer Utility, select the TIF created in the previous step. 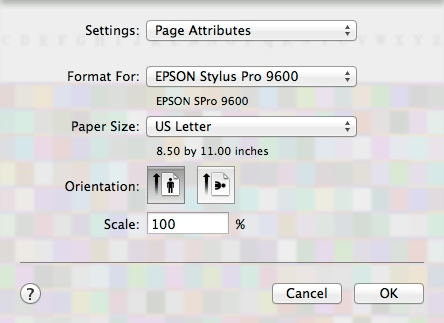 Go to File > Page Setup and select your printer and paper size, US Letter. Your paper size options may be named differently and you may have several options within US Letter. Just be sure to select the one that has the minimum borders or is borderless. Hover over the option to see the margin sizes. Select the Letter option with the smallest margins. Next, select File > Print. Under Printer Settings, select the correct media type. If you’re using a non-Epson brand paper, look on the manufacturer’s website for the media equivalent. For example, I’m using Canson Baryta Photographique 310gsm which according to their website is equivalent to Epson’s Premium Semi Gloss Photo Paper. 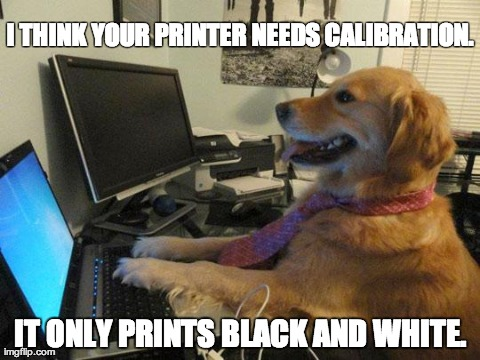 Set your print quality. Confirm ColorSettings is disabled and print away. Let the print dry for a few hours (or even overnight) before scanning. The program will run you through a set off prompts to complete the scan. First it will ask you to place the i1 on its calibraton plate. Next, it will ask you to start scanning starting a row A. The scan starts when you press the button on the side of the i1, but there is a delay. So, wait till you hear the “Bonk” sound on your computer before starting to move the device. The sound plays through the computer not the device and is very low, so make sure your volume is turned up. You can scan in either direction; top to bottom or vice versa. Alternating each line makes the whole process go faster. Center the row vertically in the ruler opening so there is whitespace on both ends. Line the row up horizontally in the center in ruler opening so that the patches aren’t touching the edges. If you have to retry a row of a few times, try re-positioning the ruler. Because we eliminated the white space on the left you can’t clip the page and use the ruler on the first few rows. Once you’re past those rows you can move the paper and clip it if you want to. I find the weight of the ruler hold the paper in place even without the clip. If you don’t have a backing board any flat surface will do but, be careful, because the color of that surface can show through the paper. Put another sheet of the same paper beneath it to prevent any color bleeding through. The last step is to generate the printer profile from the scan. First, copy AdobeRBB1988.icc (located in HD > System > Library > Colorsync > Profiles) to the ArgyllCMS Directory. Next, here’s the command I used and the breakdown. [-v] – You’ll definitely want progress shown. This process can take a while. [-D] – Very important. This is what you’ll see as the profile name in Photoshop and Lightroom. I put a leading * in the name to bring it to the top of the list and clearly differentiate the custom from standard profiles (see image below). In this example, I use the printer model, paper name, and ink type (CCpro = ConeColor Pro K3). [-S AdobeRGB1998.icc] – I used Adobe1998 as source profile for gamut mapping. I confess to doing this only because most of the threads I read suggested doing so. That’s all the color profile I use in Photoshop, so it made sense. Reading About ICC profiling and Gamut Mapping didn’t exactly clarify things. So, let’s take this one on faith. [-cmt] – “Monitor in typical work environment” Taking this one on faith, too. [-dpp] – “Monitor in typical work environment” And this one as well. The last step is to copy the .icc file from the ArgyllCMS directory to Macintosh HD > Library > ColorSync > Profiles. You’ll have to enter your password to do so. Open up Photoshop, go to print and now you’ll see your new profile available in the list of available Printer Profiles under Color Management. If you don’t see it listed, try restarting your computer. ‘Before’ print on top. ‘After’ print on bottom. 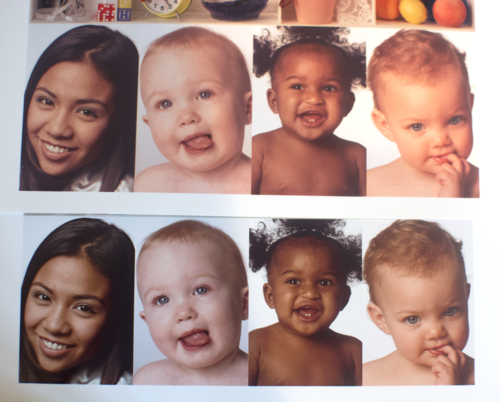 Above, I put my ‘before’ print on top of my ‘after’ print and took an (admittedly poorly lit) photo of the two to illustrate the difference, which I found most pronounced in the skin tones on my test image. The bottom print made with my custom inks and profile had less of a color cast and much more natural colors in the faces. I also compared the ‘after’ print to a test image I printed a few months ago on my 2200 using Epson’s inks and profile. Using the custom ink/profile combination gave results that looked much closer to output from Epson’s standard ink/profile combination. In closing, ArgyllCMS is a very sophisticated application of which, like Photoshop, I feel I am only scratching the surface of. From the forums I’ve read, its level of sophistication is on par with X-rite’s i1Profiler and superior to the Colormunki’s software. As my understanding of color management practices increases I may revisit some of the options I used here and get even better results. That being said, I was able to get results I was very happy with with only a small learning curve. Some users may be turned off using a command line interface, but having gone through the steps once and saving the commands in a text document, I feel that the next go around would be painless. On the hardware side, the i1 may be an advanced piece of kit, but in my opinion, it could use some better product design. You can tell it was engineered for one purpose and then retrofitted to serve others. The form factor is clearly designed for reading printed targets. Which is evident by all the awkward accessories needed to set it up to do display or projector calibrations. The Colormunki, with its single-body multi-purpose design, is superior in comparison even if it’s inner-workings are inferior. If I had to make the choice again, I might opt for the one that took up far less room in my small NYC apartment.